After the presentation of the book, Your Baby is Speaking to You (Nugent, 2011), I introduced the workshop by stressing the importance of the role as nurses in scaffolding the healthy development of children through their support of the “first relationship”. I told them that (1) Babies are speaking to their mothers; (2) mothers can listen to their babies; and (3) they, as nurses, could help mothers learn to listen to their babies in a way that could make a great difference to the future health and wellbeing of the children. Ginger and I stressed the importance of making the mother feel that she can gain competence in listening to her own baby, that she can become the expert of his communications. Then, using Kevin’s book as a guide, we introduced some of the basic ways that infants communicate through manifestations of their state – quiet, alert, crying, fussy, deep or light sleep, etc. We talked about the way babies make transitions among these states. Then, we talked about how individual babies have different and characteristic ways of making transitions, and how through learning how to “read” these communications from the baby, the mother can comfort her baby’s natural distress as he moves through transitions. At that point, without our original plan for demonstrating the NBO in the maternity ward, we had to improvise. It occurred to me that Ginger and I could play the roles of mother and nurse, and when I suggested this to Ginger, she immediately and enthusiastically rose to the occasion. I had not previously realized that my teammate was such a good comedian and creative improviser. Ginger snatched up her small cloth purse to represent “the baby”. 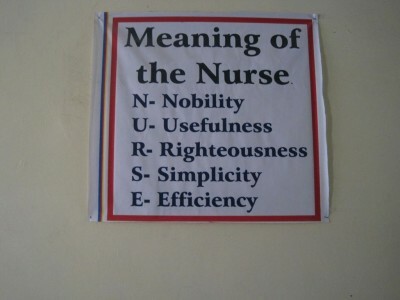 Playing the nurse, I pretended to enter the room and greet a mother with her newborn. “You have a beautiful baby!” I pronounced. Ginger smiled, but then told me, “But he is crying all the time!” I suggested to the group that the natural response of a nurse to a crying baby might be to pick up the baby and comfort him. Then, I asked the group how they imagined the mother might respond if the nurse picked up the baby and was able to comfort him. One student answered that she thought the mother would be pleased. We then acted this out with my taking up the baby and comforting him, and Ginger making a woe face to indicate her feelings of inadequacy at being less competent than the nurse at comforting her own baby. The students laughed and seemed to understand our point quite well. 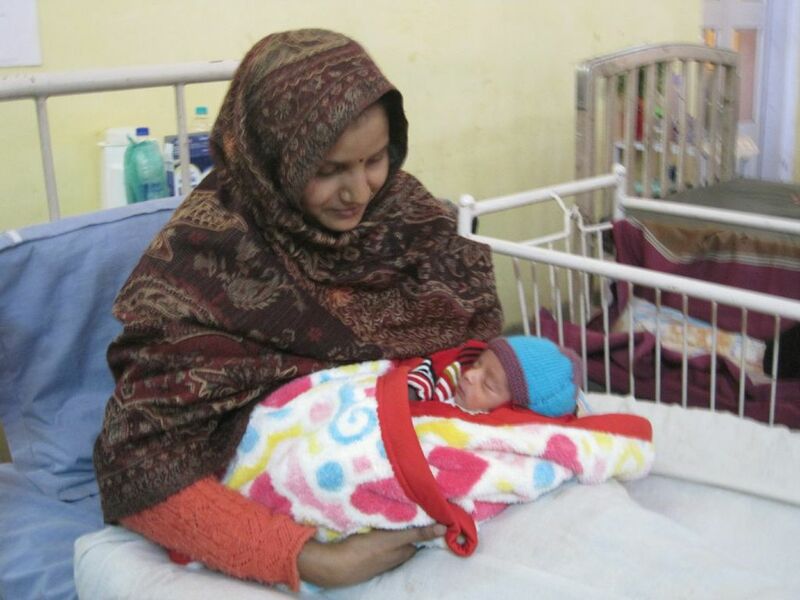 Then, Ginger told “the nurse”, “I think my baby is uncomfortable, and I don’t know what to do.” Ginger – who has a more substantial background in the NBO and also in home visiting mothers and infants – was luckily cueing me at every step. In response to her cue, I responded, “How does your baby like to be held? Do you think that if you held him in a different position he might be more comfortable? Why don’t you try some different ways of holding him and see what you discover.” Ginger pretended to hold her baby in different positions and did indeed “discover” a way that made him more comfortable. I congratulated her on “knowing” her baby. Ginger then said, “But even so, my baby seems to cry a lot of the time.” I responded – again to Ginger’s cues (which actually were quite transparent and often elicited a laugh from the students), “Maybe you have a sensitive baby. Have you noticed that he is sensitive to light?” Ginger said, “Yes, I have noticed that he makes his eyes go like this (squinting) in the daylight.” Another appreciative laugh. I said, “Well, let’s lower the window shade and see what happens.” I pretended to do so, and Ginger agreed that this seemed to have a positive effect and seemed pleased at this new knowledge about her baby. The street noises were very loud and sometimes drowned out our speech, so it was easy to play out a baby who was sensitive to loud noises. This elicited more laughter, as the noises of trucks and motorcycles and the banging of construction intruded into the room. My favorite part was when we wanted to demonstrate a mother discovering that her baby needed to be swaddled. Ginger made her soft purse strings flap around until she and I decided to swaddle the baby so that his little “arms” were held close to his body. Continuously, we repeated the necessity of helping the mother feel competent, and as if she knew her own baby better than anyone else. The workshop was a very enjoyable experience for us, and I did have the impression that the students learned something important. 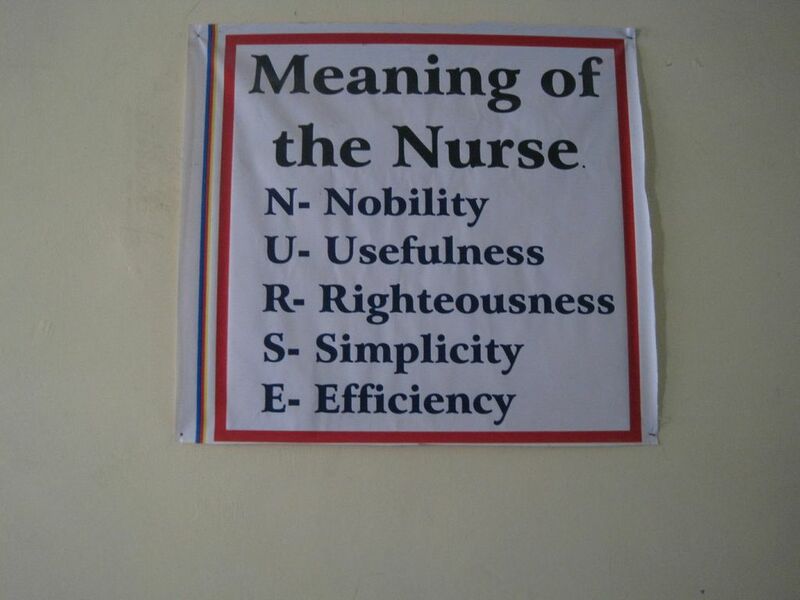 I was touched by the sign in the nursing school, listing the qualities of a nurse: N=nobility; U=usefulness; R=righteousness; S=simplicity; E=efficiency. During our first visit to the Christian Hospital last year, Ginger and I were introduced to the nursing school and also visited the maternity ward and saw several women who had just given birth. 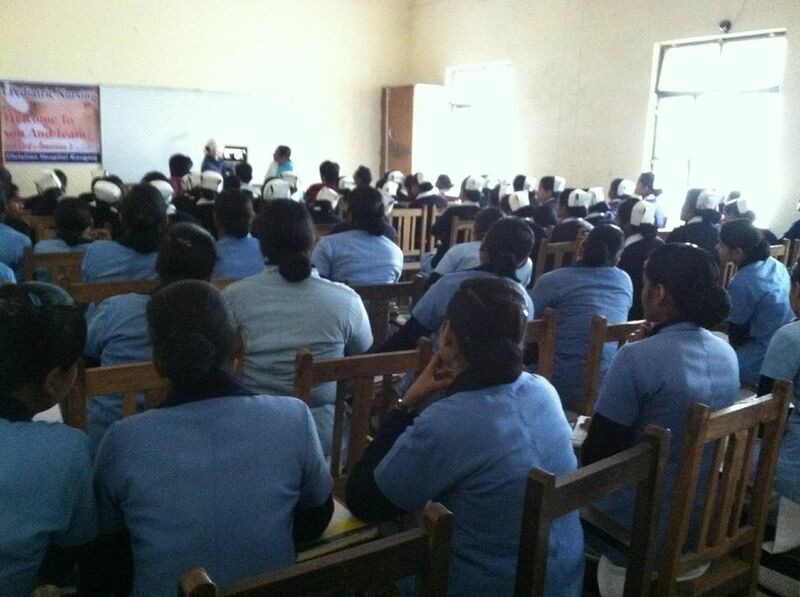 As I considered this visit, I thought that a potentially valuable offering to the hospital would be to give a workshop to the nursing students, much as I did for the orphanage caregivers in El Salvador. The subject of the workshop to the nursing students might be the value of the “first relationship” and their potential role in scaffolding it. Communication with the hospital by email was spotty, and though in a late message from Dr. HJ Lyall, he mentioned a workshop, I was not at all certain that he or the nursing school had any interest in such a program. I became concerned that my proposal would be received as an obligation, rather than as a benefit. Just before I left, I wrote to reassure them that I was prepared to do something “casual” and to respond, upon my arrival, to whatever they let me know was their interest or need. Thursday afternoon, on our arrival, Dr. Nina Lyall gave us a tour of the hospital compound and visited the maternity ward, where a new mother proudly cradled her infant son. Later, Dr. Lyall, asked us what time we would like to give the workshop the following day, and after some discussion, we settled on 10 o’clock. That would give the nursing students time to finish their morning tasks and would give us a chance to attend the morning service in the chapel, something we were eager to do. That evening, we had a lovely dinner with both Drs. 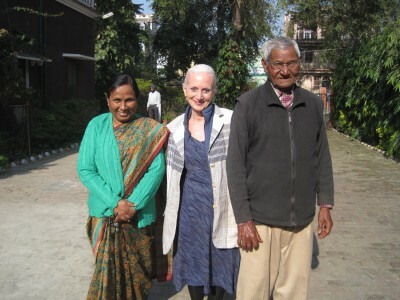 Lyall, their son, Himanshu, who has a graduate degree in hospital administration and has built the eye department into the substantial program that it is today, and his wife, Sonia. The next morning, after a good sleep, we rose to hot tea and prepared for the church service before breakfast. Dr. HJ Lyall accompanied us to the service. 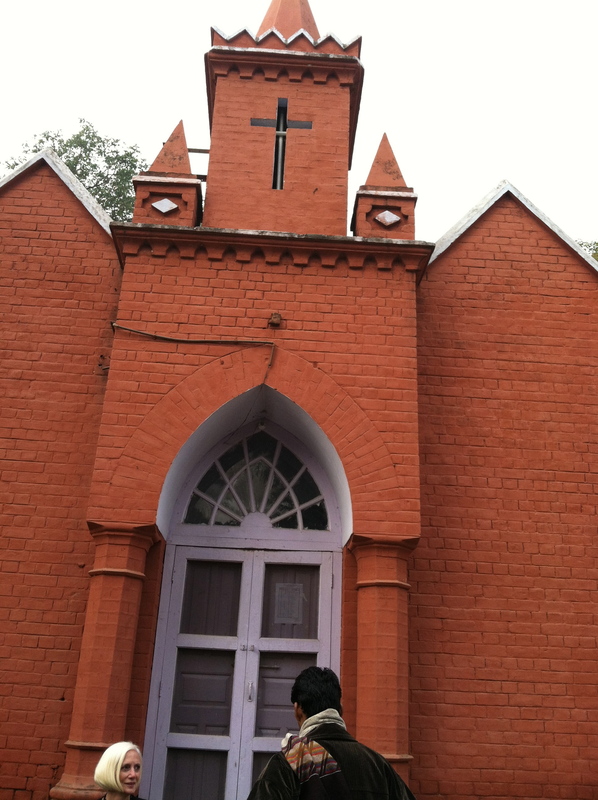 As we approached the chapel, we were greeted by the music of song, a keyboard instrument, and the tambourine. I suppose this loud and rhythmic music was a hymn, though not like any I am used to. It was clearly religious and very enjoyable to listen to and had the quality of a melding of Christian ritual with indigenous culture that I have noticed in El Salvador and other parts of the world. The small chapel was packed with the nursing students – row after row of light blue dresses and white cap atop neat black hair, pulled back. As I sat in one of the back rows, I saw several of these young women adjust the pins in their hair to settle their hats more firmly on their heads or to secure a stray lock of hair. Dr. L introduced me and Ginger to the community in the chapel. After chapel, we joined the Lyalls for a delicious Indian breakfast and then headed for the nursing school. Dr. Nina Lyall had volunteered to translate our words into Hindi, something for which we were very grateful. We were hoping that we could take the students into the maternity ward and use a version of the NBO as a way of demonstrating to the new mother – as well as the nursing students – the way mothers can learn to “listen to” their newborn babies (Nugent, ) In this example of the Touchpoints model, nurses caring for pregnant women or new mothers in the maternity ward can offer something like the kind of intervention described in the previous posting. They can show mothers how to become expert in understanding their own babies, and grow in their confidence and comfort as mothers. We now know that this kind of intervention can reduce the occurrence of post partum depression, a significant risk factor in child development (Brandt & Murphy, 2010, p. 185). The Head of the School of Nursing, Mr. Jinson Mathew, had discussed with us and with the Lyall’s how to structure the workshop so as to accommodate the number of students, and we had decided to give two consecutive workshops in the same relatively small room. Nevertheless, when we were greeted with about forty students in the first workshop, we were taken aback. Of course, we realized that we could not take them all into the maternity ward to see the one new mother and her baby. 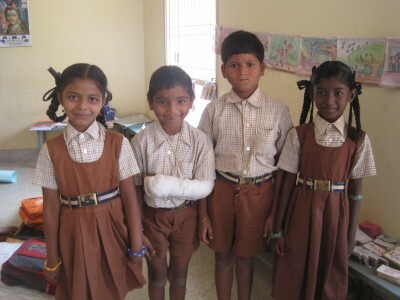 It was with pleasure but also some apprehension that we surveyed the fresh and eager faces of the young women in the room and wondered what we were going to do instead, how we were going to engage them. We calmed our anxiety by presenting them with two copies of Kevin’s book. In the next posting I will describe the actual workshop. Brandt K, Murphy JM (2010), Touchpoints in a nurse home visiting program, in B Lester J Sparrow (eds), Nurturing Children and Families: Building on the Legacy of T. Berry Brazelton, Wiley-Blackwell, pp 177-190.